One of his novels “the Old Woman’s Days” is about the mishaps of an old lady and her flock that ignored the power of March, and as a result she had to face the wrath of the insulted Month, that “borrowed” a few days out of February and unleashed a catastrophic weather. This story sounds a little too familiar to us, Ikarians. 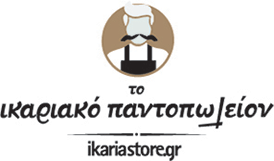 Could it be that Ka rkavitsas passed through Ikaria? Is there any chance he met the great-grandmother Archondou, and she told him the story of the Old Lady of the Evil Passage? Probably not. He might have heard it from somewhere else, as so many places around Greece share common stories and traditions. But, I’ll take the chance to revisit the story and refresh our memories. Once upon a time, in the southern parts of Ikaria, just above Ksilosirtis, on the plateau of Kampa, just across Holy Mary’s church, lived an old lady, all alone apart from her goats. All alone to graze them, to milk them, to shear them, to take care of them. And in turn they gave her milk, and cheese, meat and wool, to sell, and make ends meet. And everything went well, until one year… That winter was harsh, and heavy but finally going away. March was about to end, as well, and the old lady could not hide her happiness, as she had ensured an abundance of products, and sung: “As you leave me, March, I sheared ten kids, and ten young goats”. Why did she have to do that? March heard her, and was furious! He decided to teach a lesson to this shameless woman for defying him, and force her to humility. But, back then, March had only 28 days whilst February had 31. He goes to February and convinces him to lend him a few days, just enough to get his plan in action. And so he did, without, of course, February realizing he was not getting his days back ever again. Such was the roar and the noise, so forceful was the rain and the disaster that the mountain had never witnessed before. The universe went black, the rocks were unearthed, the island flooded. There goes the woman’s hut, there go the goats. All drowned. But she didn’t have any better luck herself. First she saw all her life get carried away and destroyed by the flood, until, finally, the water took her as well, throwing her beaten body upon rocks, through canyons, over the ravines. At last, cold and lifeless she reached the sea, near the East side of the village, at Kakoperato (i.e. the Evil Passage), were she remained, petrified, to eternity. The Old Lady of the Evil Passage. Is it a myth, a tale, or just one of Nature’s sculptures? Whatever it is, she still stands there, weak against the wrath of March, majestic to the rest of the Island. Note: Andreas Karkavitsas’ story “the Old Woman’s Days” was first published on May 1886 in “Evdomas” magazine.